Today we continue our celebration of the Nativity, better known as Christmas. The 12 Days of Christmas started on December 25 (or for many of us on Christmas Eve) and continues until January 5, when we get ready to celebrate another great Feast, the Epiphany, on January 6. On that day we commemorate the Magi, the Three Wise Men, arriving to worship the newborn King. And today, here at St. John’s, we are also having an additional celebration – it is the 125th Anniversary of the death of our founder, Henry Porter Baldwin. After the 10:00AM service and coffee hour, we will head over to Elmwood Cemetery (maps will be available) to lay a wreath at his monument. 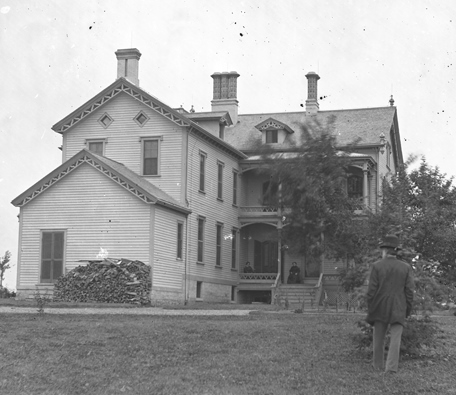 Pictured is Governor Baldwin, his monument, and the house which was at one time located across Woodward Avenue where the freeway now stands. It was in that house that he met, on December 6 and 13, to discuss the possibility of starting a parish, and on December 27, that the incorporation papers were signed and Vestry elected. That day, in 1858, Henry Porter Baldwin was elected Senior Warden, a position that he held until his death on December 31, 1892. A merchant turned banker, Governor Baldwin was a founder of the Republican Party, campaigned for Abraham Lincoln, was elected Governor of Michigan, and then appointed by the state legislature to be the US Senator from Michigan (Senators were not directly elected back then). He was a great civic leader for Detroit, as well as a luminary in the Episcopal Church. He was a member of the Diocese Standing Committee for 48 years, and for nearly 50 years represented the Diocese of Michigan as a delegate to The General Convention. The Vestry published a book of remembrances shortly after his death, which was unknown to me until recently when a copy from the University of Michigan Library appeared on Google Books. In it are tributes from the business, government, and church community, reprints of his newspaper obituaries, and his funeral sermon. It must not be doubted, as a layman, he believed in the apostolicity of the Episcopal Church; he believed that the Bishops are the true successors of the Apostles. He felt that we have a treasure, the treasure of true catholicity, which we, the rightful trustees, hold for the use of the American people. He did his best, and that best was always excellent, to augment the Episcopate, to make the apostolicity of our Communion known to all; to broaden men’s ideas of the scope of Catholic truth; to deepen their love for the love of God. In addition to his diocesan involvement and work with the General Convention, he also served on many church related boards which required him to travel to New York several times a year, not an easy task in the 19th century. In his funeral panegyric, Fr. Prall notes that the founding of St. John’s was motivated by Baldwin’s desire to serve all mankind. While Senior Warden of another parish in the city someone said, “The Episcopal Church is a church only for the wealthy and ambitious; there is no room for the poor and the humble in it,” He replied, “It is not so; if it were, I would leave it at once.” We all know this is not so, and one of the proofs that it is not, is the action that Henry Porter Baldwin then took. He went home and thought the matter over. It occurred to him that there was room for another parish north of the Campus Martius, and that there were many people there, some of them plain and simple, who were unchurched; so he resolved that a new parish should be formed. And so he set in motion the founding of St. John’s. In a copy of his Will we have in our possession, we find that he not only left money to his family and St. John’s ($5,000, the equivalent of $130,000 now), but to the Diocese, the National Church, the former St. Luke’s Episcopal Hospital, Home, and Orphanage in Detroit (now Canterbury on the Lake in Waterford), The Protestant Asylum, the Women’s Hospital, the Children’s Free Hospital, Elmwood Cemetery (where he is buried), the University of Michigan (where he served as a trustee and gave a building on campus while living) and most of his art to the Detroit Museum of Art. Today we honor his memory. Unlike the men who followed him and are remembered with public statuary, such as Hazen Pingree who sits in Grand Circus Park looking towards St. John’s – he bought H.P. 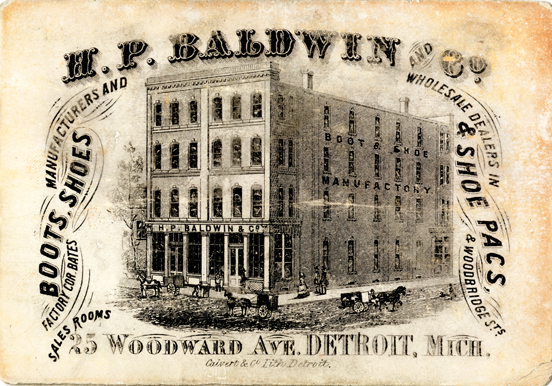 Baldwin’s shoe store from him – there are two grand edifices on which his memory rests. One is the State Capital building, which he proposed and convinced the legislature to build and for which he laid the cornerstone, and the other is this parish church. We give thanks to God for Henry Porter Baldwin’s vision, faithfulness, and generosity.